In the year nineteen hundred and fourteen Anno Domini, amid a world conflict, the birth of the infant State of Ireland was announced. Almost unnoticed this birth, which in other times had been cried over the earth with rejoicings or anger. Mars, the red planet of war, was in the ascendant when it was born. Like other births famous in history, the child had to be hidden away for a time, and could not with pride be shown to the people as royal children were wont to be shown. Its enemies were unforgiving, and its friends were distracted with mighty happenings in the world. Hardly did they know whether it would not be deformed if it survived: whether this was the Promised, or another child yet to be conceived in the womb of the Mother of Parliaments. Battles were threatened between two hosts, secular champions of two spiritual traditions, to decide its fate. That such a conflict threatened showed indeed that there was something of iron fibre in the infant, without which in their make-up individuals or nations do nothing worthy of remembrance. Hercules wrestled with twin serpents in his cradle, and there were twin serpents of sectarianism ready to strangle this infant State of ours if its guardians were not watchful, or if the infant was not itself strong enough to destroy them. It is about the State of Ireland, its character and future, I have here written some kind of imaginative meditation. The State is a physical body prepared for the incarnation of the soul of a race. The body of the national soul may be spiritual or secular, aristocratic or democratic, civil or militarist predominantly. One or other will be most powerful, and the body of the race will by reflex action affect its soul, even as through heredity the inherited tendencies and passions of the flesh affect the indwelling spirit. Our brooding over the infant State must be dual, concerned not only with the body but the soul. 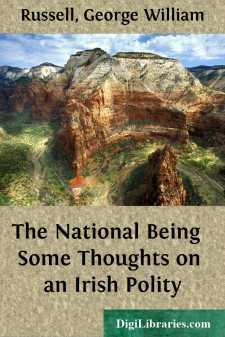 When we essay self-government in Ireland our first ideas will, in all probability, be borrowed from the Mother of Parliaments, just as children before they grow to have a character of their own repeat the sentiments of their parents. After a time, if there is anything in the theory of Irish nationality, we will apply original principles as they are from time to time discovered to be fundamental in Irish character. A child in the same way makes discoveries about itself. The mood evoked by picture or poem reveals a love of beauty; the harsh treatment of an animal provokes an outburst of pity; some curiosity of nature draws forth the spirit of scientific inquiry, and so, as the incidents of life reveal the innate affinities of a child to itself, do the adventures of a nation gradually reveal to it its own character and the will which is in it.